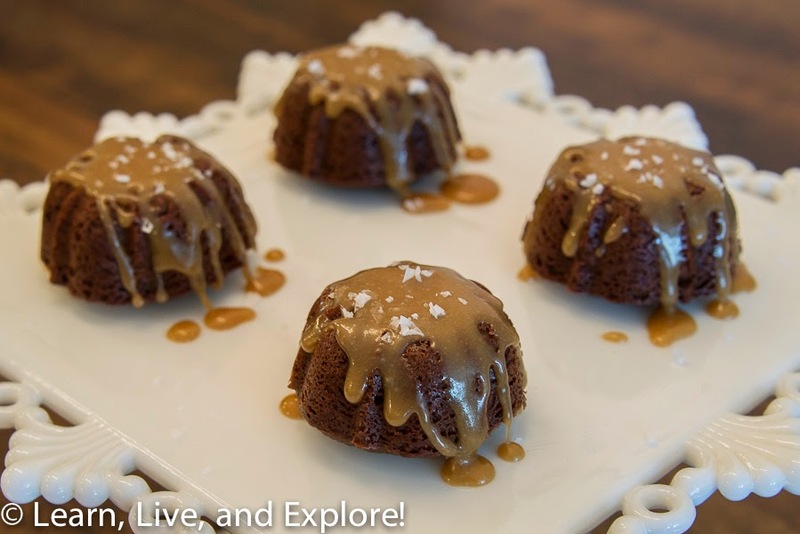 Salted Caramel Chocolate Guinness Mini Bundt Cakes ~ Learn, Live, and Explore! St. Paddy's Day is only days away, which means I impulse bought a 6-pack of Guinness on my last grocery run, and I've been trying to find fun new ways to make a stout-based baking project. There's the standard combination of stout with irish cream, which I've been happy with in the past, but I am a sucker for salted caramel, so when I found this recipe from The Hungry Housewife it jumped to the top of the list! I opted to make mini bundt cakes instead of one large one so I could share these yummy treats more easily. In a medium saucepan over medium heat, bring the Guinness and butter to a light boil, then add the cocoa powder and whisk until smooth. Remove from heat and set aside. In the bowl of an electric mixer, beat the eggs, sour cream, and vanilla. Add the butter/Guinness mixture to the wet ingredients slowly and beat until just incorporated. If the Guinness mixture is still hot, only initially add a little bit to temper the eggs before adding the rest at a constant, slow stream to prevent the eggs from "cooking." Add the bowl of dry ingredients to the wet ingredients and beat until just combined. Gently fold the mixture with a spatula to ensure all of the dry ingredients have been mixed in. Fill the mini bundt cake wells 1/2 full with batter. Bake for 17-20 minutes until a toothpick comes out clean. Allow to cool in the pan for a few minutes until turning the mini bundts out onto a wire rack to cool completely. Cover in plastic wrap and place in the refrigerator overnight. For the salted caramel glaze, in a medium saucepan, bring the butter, dark brown sugar, heavy cream, and salt to a rolling boil, stirring constantly. Add 1/2 cup of the sifted powdered sugar and whisk until smooth. Continue to add and whisk in the powdered sugar one tablespoon at a time, making sure that the sugar lumps are broken up and the glaze is smooth. 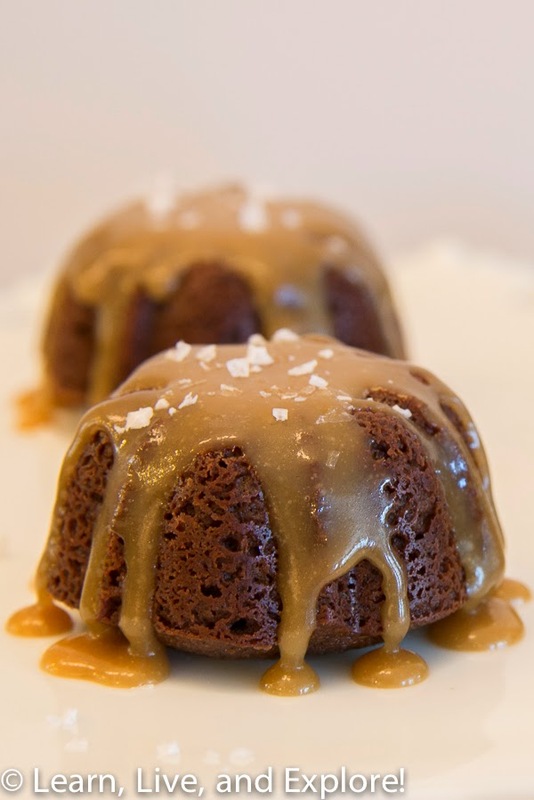 Remove the cakes from the refrigerator, place on a serving plate and drizzle the salted caramel glaze over the cakes. Sprinkle the fleur de sel or sea salt flakes over the glaze. Hi, I hope you have a good day. Thank you for inspiring us. You bring joy to our face. Visit my site if you have time.